Betfred online casino is one of the oldest operating casinos in the online world. It was founded by brothers Fred and Peter Done back in 1967. They started the business with one land-based betting shop in Salford and together, grew it to one of the biggest independent bookmaking sites in the world. The company is based in Birchwood, Warrington and is active in sponsoring events in the UK such as the Scottish League Cup and the World Snooker Championship. Today, the site is home to many selections like horse racing, sports betting, Totepool, bingo, lotto, poker, and table games. In this Betfred review, we will scrutinize its jackpot offers, games, and other things critical for gamblers to decide whether a casino is worth a shot or not. The casino split its promotions into different areas. Below is a breakdown of the Betfred bonus packages, including welcome offers for each category. Total of 13 ongoing promotions. Bet £10 Get £30 is available to new members from the UK. If you register, you must deposit £10 and you will get £30 in free bets to your account. Beaten by Half a Length applies to horse racing. If you bet on a horse that ended in second place by half a length or less, the casino will refund your stake in the form of a Maximum refund you can get is £10. Deposit £5 and Get 10 Free Spins – This does not apply to all games. You must use the promo code GAMES to get your 25 free spins upon deposit. Emerald Isle £10,000 – The grand prize for this promotion is a trip to the Emerald Isle. You can only join if you play Rainbow Riches. Welcome Offer – New players get 50 free spins and this must be used within seven days. The minimum deposit amount is £10. This is also the minimum stakes to play. Premiere Prize Draw – Opt-in is required to participate. This applies to slot games only. You can only join once with a minimum stake of £20. The total grand prize pool is £4,000, and this will be shared by the winners. Stakes Live – You will get five golden chips if you are a new player, but only if you use the code LIVECASINO upon your deposit. You will not get your golden chips back with your winning, and this expires 7 days after receipt. Game of the Week – You will get 1 comp point for every £5 wagered on the Dragon Kingdom. This is a promo that best suits those who want to elevate their VIP status. Blackjack 5-Card Trick – Only available in Live Casino. A winning hand that has five cards will get a bonus pay of £25. Total of 15 promotions ongoing. £25 Matchup – The casino will matchup your bet for a maximum of £25. This only applies to new customers and the bet must be placed in the lottery games. Irish Lotto – For a bet of £1, you can win as much as £701. There are six promotions for virtual games. Welcome Offer – Bet £10 and Get £30. This is only available to new players. The casino will replace your £10 bet with £30 if you register. The bet can only be placed on virtual games. Virtual Fever – You must opt-in to join. In this, you can bet a minimum of £5 and you may get free bets up to 10% of your stake. The maximum you can get is £10. There are seven promotions for poker. You can either play with a machine or a live player. One of the best is the 200% deposit bonus, which is maxed at £1,200. You can also receive a £10 poker package, and all your winnings are yours to keep. 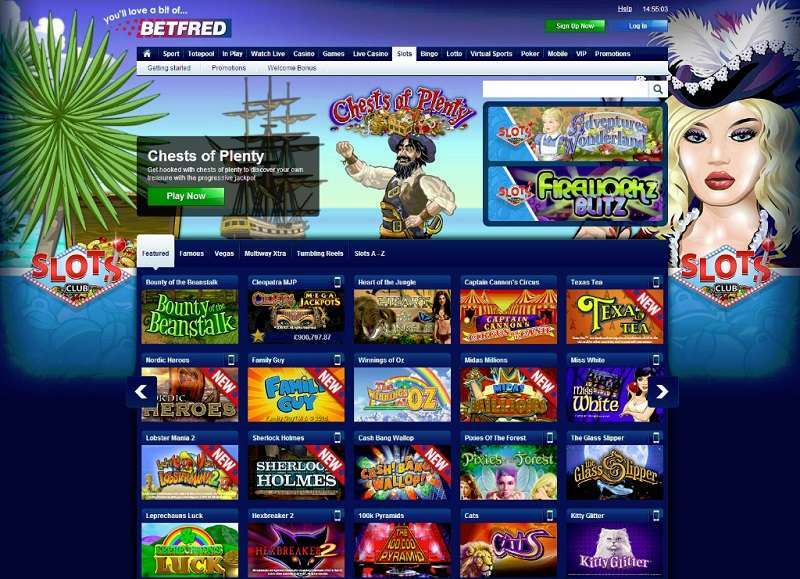 Betfred houses hundreds of games and is not limited to table games. It offers many sports-betting options, including in-play bets and virtual races. Below is a list of all the sports where you can bet. 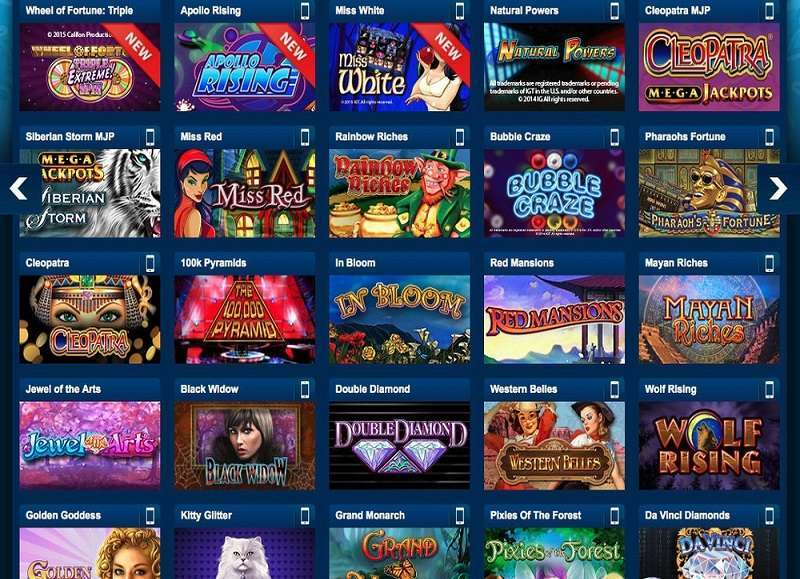 Betfred offers several table games such as roulette, blackjack, and baccarat. There is only one bingo room as of the moment, but different prizes are offered for every event. More than a dozen lottery games are available. Games range from a single ball, pick 3 and match 3, pick 4 and match 4, and many more. You can bet as little as £1 and win £701. Betfred is available for instant play and there is no download required. There is an exception as there are games that need installation. The site is also optimised for mobile. Betfred accepts multiple deposit options for real money. And each deposit option has a minimum requirement depending on the currency you use. Check the table below for more details. The casino does not charge any deposit fee if the source is a credit or debit card. However, some banks and financial institutions charge fees if the money transferred is used for gaming. If the customer will fund his account using Neteller or Skrill, only the first deposit for the day is free of charge. Betfred will charge 2.9% for the succeeding deposits if both of these funding options are used. A scanned copy of the front and back of all cards on the account. A scanned copy of a recent bank statement. A scanned copy of a valid passport, driver's license or identity card. Betfred.com will not charge you for depositing funds with your debit or credit card, but please be aware that some credit card issuers may charge you a fee for using the card for gaming purposes. Betfred.com allows one free deposit per day made using Neteller and Moneybookers. All additional transactions may be subject to a 2.9% charge, and this charge is applied at Betfred’s discretion. Minimum and maximum withdrawal amounts are shown in the table below. For bank transfers, the casino will shoulder only one bank transfer fee every 28 days. For urgent withdrawal, the customer will be charged £25. The limit for bank transfer per day is £25,000 or its currency equivalent. A client can also withdraw from Betfred shops. These are land-based shops scattered across the UK. Below are the conditions. Withdrawal to Betfred shops is only possible if you used it to deposit funds. You need to present a photo ID when withdrawing funds. Any withdrawal less than £250 will be processed in the same day. Anything above £250 is subject to a 48-hour review and approval. A client can only withdraw for Betfred shops once per day. Different withdrawal methods also have different withdrawal timeframes. Withdrawal to eWallets like PayPal and Skrill can take up to 48 hours. Credit and debit card withdrawals will take up to five days. The player’s card institution may take up to 30 days to reflect the funds in his account. Bank transfers and checks, after the due identify verification, can take up to seven business days. All withdrawals are subject to a review timeframe of up to 48 hours. 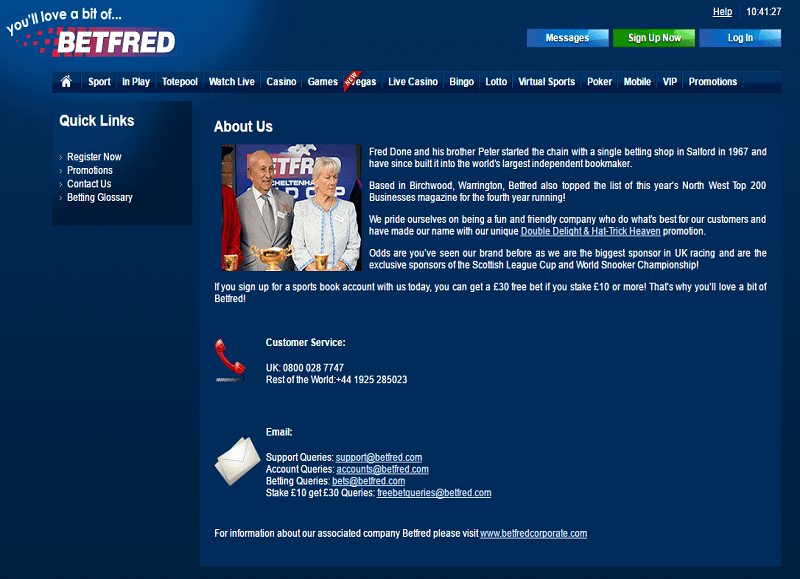 Betfred also has a live chat feature that is manned 24/7. Currently, the website is only available in English. Playtech – A market leader in gambling software that offers not only games but big data analytics and financial management. Boss Media – One of the oldest providers worldwide. It is a Swedish company that is backed up by gaming institutions GTECH and G2. Ash Gaming – A company that was established in the year 2000. It is popular because of its diversified slot games, most especially when it released Rubik’s Slot. IGT – One of the best and largest software developers in the world. It services hundreds of online casinos. Realistic Games – A gaming company based in the UK. It was founded in 2002 and has released games both in the desktop and mobile platforms. Blueprint Gaming – Also a UK-based company. It is part of a German corporation called Gauselmann Group. Its games are available on desktop, mobile, and in over 100,000 land-based casinos. Betfred is a casino not to be trifled with. The founders have more than 30 years of experience, and they fully understand what gamblers need and want. As one of the biggest and oldest operators in the world, Betfred Casino is like a gambler’s candy store. There are countless games to choose from, and anyone who has grown tired of playing a game can move on and try the next. The casino does not limit itself to its roots. It is consistently updating its game selection and keeps up with the needs of players, whose appetite for games is insatiable. One drawback is that a player has very few financial institutions to choose from when it comes to depositing and withdrawing funds. But despite this, the casino compensates by not imposing a small withdrawal limit. Add to that the fact that you can withdraw your payout physically through hundreds of Betfred outlets in the UK.